A number of photos and videos exist that show Buk launcher traveling through rebel-controlled territory. What is the story behind each of this material? Does it really implicate rebels? Was some of it digitally altered? What other important but little-known information exists related to MH17? Did anyone benefit from this catastrophe? This paper answers all of these questions. The language barrier, the complexity of the conflict in Ukraine, and disinformation are just some of the obstacles that one faces when trying to find or verify certain material regarding MH17 incident and Ukrainian conflict. Some pieces of the puzzle would have only been apparent to those who closely monitored the conflict before the catastrophe. This paper includes many links to articles, videos, and to sources that have additional information. In many cases, this allows the reader to verify the provided or translated material. No expert knowledge is required in order to understand the main parts of the paper. No photo or video evidence seems to exist at all (May 2015) that would show: (a) Buk launcher with nearby rebels; (b) just the Buk launcher prior or after July 17–18, 2014 that allegedly belonged to rebels. This makes the likelihood that rebels had Buk and used it to shoot down MH17 very low. What exists is a photo from Twitter of allegedly captured Buk (see “Buk from Twitter”) and the known three videos and four pictures, all allegedly taken on July 17–18. These videos and pictures, which show the Buk vehicle, but no nearby rebels, will be discussed in another chapter. Here we look at the origin of some of the rumors that rebels had Buk prior July 17, 2014. All of those rumors were of a captured Ukrainian Buk, not of it being provided by Russia. Kiev also denied that any of its Buk vehicles were captured. 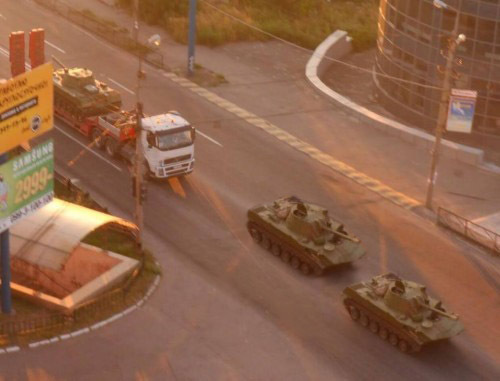 On June 29, 2014, a number of Russian mainstream news sites (for example, Tass, RIA Novosti), reported, citing rebel representative, that rebels captured Ukrainian base, А-1402, which allegedly hosts air defense systems in Donetsk region, including Buk systems. Tass wrote that the quantity and the state of the captured vehicles (or if any were captured at all) is unknown. Neither these or similar articles from Russian mainstream media included pictures or videos of the captured base or of captured air defense systems. On the same day, Alexey Dmitrashovsky, a spokesperson for the “anti-terrorist operation (ATO),” told Ukrainian Pravda that the attackers managed to capture part of the territory of the air defense base, as well as part of the personnel. He said that two trucks were stolen. Answering Ukrainian Pravda’s question, he said there was a Buk complex in the base in a non-working condition, and that all the working ones are located at other strategic sites. 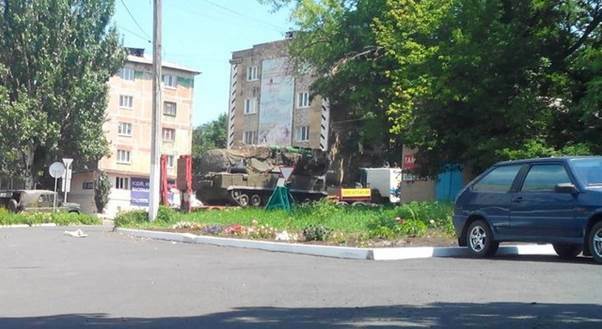 On June 29, a picture of an allegedly captured Buk from this base appeared on Twitter. We look at it in another section (“Buk from Twitter”). On July 18, Ukrainian attorney general told Ukrainian Pravda that “terrorists” (rebel forces) did not have Ukrainian Buk or S-300 systems. On the same day, Financial Times wrote that Ukrainian Ministry of Defense has accounted for all 60 of Buk launchers that it operates. There is a website, which keeps track of, on top of other things, confirmed military aircraft casualties in the Ukrainian conflict. It shows that more than 20 Ukrainian military aircrafts were destroyed: about half of that before the MH17 incident, half later. No video or photo proof seems to exist at all that any Ukrainian military aircrafts were shot down by anything other than MANPADs. It seems rebels did not have problems taking them down without sophisticated air defense systems, such as Buk. Nevertheless, one incident needs to be looked at more closely. AN-26 was shot down just three days before MH17 near Ukraine-Russia border. What’s peculiar about this incident is that Ukraine President’s site specifically said that it was shot down at 6500 meter altitude and said that a more powerful missile system was used. As we look more closely, no proof that it was shot down at 6500 meter altitude or that a sophisticated system, such as Buk, was used exists. Though IL-76 is a big passenger jet that can fly at a high altitude, where MANPADs cannot reach, it was destroyed as it was about to land at Luhansk airport. Ukrainian coordinator of the “Information Resistance” blog, Dmytro Tymchuk, said, according to Ukrainian Press, that three MANPADs were found not far from the airport. Neither side said that it was or could have been destroyed by a sophisticated air defense system, such as Buk or S-300. Three days before the incident with MH17, on July 14, Ukrainian AN-26 was allegedly shot down near Ukraine-Russia border. Russian state-owned Rossiya 24 news agency reported about the shot down AN-26, didn’t say what type of weapon was used, but provided a quote from Ukrainian press center of ATO, confirming that AN-26 was shot down. Their article also includes a YouTube video of a damaged plane in the sky and says that, most likely, this is the same AN-26. Russian Spring published two YouTube links, which allegedly show the damaged AN-26 (one video is practically the same as in Rossiya 24 article). LNR [Luhansk People’s Republic] leader Igor Plotnitsky told RIA Novosti that AN-26 was taken down by MANPADs, that few people of the crew were captured, that the altitude of 6500 meters would be too high for good air surveillance, troops don’t jump [plane doesn’t unload] at such altitude, and he thinks the aircraft was flying at an altitude not higher than 3000 meters. Vzglyad website, citing “rebels from social media,” said that this AN-26 was shot down with Buk. Vzglyad editor has omitted certain very important words from that social media post (read “Vzglyad article” section for more details). No video and photo materials seems to exist that anything other than MANPADs were used to bring this AN-26 down. The use of rockets, such as Buk, would probably destroy the plane in the air along with all of the crew, and the Buk rocket would leave a trail, but as is written on Ukrainian President’s site, some of the crew safely parachuted and contacted the HQ, and no video or photo of the trail seems to exist. After this incident, on July 14, Ukraine has issued new restrictions in its air space (NOTAM). 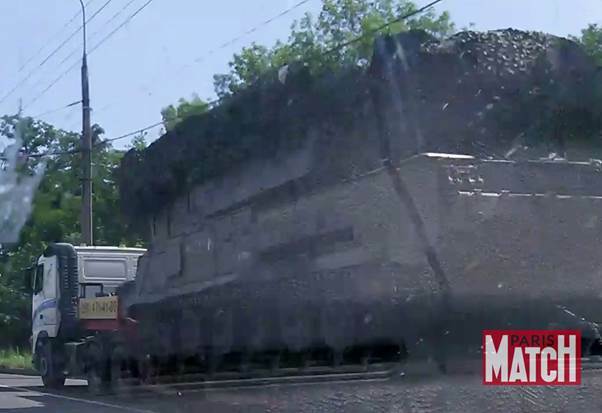 Overall, as of May 2015, only three videos (Luhansk, Snizhne, Zuhres) and four pictures (Snizhne, Torez, two Donetsk/Paris Match photos) of what looks like some sort of Buk vehicle, moving allegedly through the rebel territory or being transferred by a truck, are known to public. The location of each photo and video is known as well. A link to Google map with coordinates is provided under each material in the following sections. Based on this information, we notice an interesting pattern: all videos were filmed practically at the respective cities’ entrances (or at the edge of the city), while all photos were taken deep within the cities. The Paris Match photos show clear signs of photo manipulations. The other two (Torez, Snizhne) could have been manipulated as well: They are of relatively low resolution and low quality. The objects of interest are of small size, making it hard to verify whether the Buk and truck are real or were inserted with a photo manipulation tool. Another indirect evidence that proves the pictures are most likely fake is the lack of other videos or photos recorded by anyone in the cities, where there pictures were taken (except the very first video that was filmed in Snizhne, but only by the entrance). As of May 2015, no such additional material is publicly available (everything what’s in the official JIT video related to Buk is examined in this paper). The videos, however, are much harder to fake. They are real. However, an important detail needs to be taken into account: Someone who closely followed the Ukrainian conflict would know that Kiev launched a massive offensive (probably in the beginning of summer, when the new Ukrainian government received more legitimacy), and that rebel-controlled territory was rapidly shrinking. It seems as if Kiev wanted to solve this conflict as fast as possible with force by a symbolic date of Ukraine’s Independence Day. Another detail is rebel forces had much fewer people than they have now. The territories, marked blue and yellow, show us land that was under the control of Kiev’s forces. The rest was allegedly controlled by rebels. What’s important is that according to this Kiev’s own map, we can see that Kiev’s forces were right by Luhansk, where the most important video of the Buk with a missing rocket was made. We can also see that Kiev controls all territory South of rebel’s. Kiev’s forces are practically by Snizhne, too. Zuhres, where the third video was made, is about 40 kilometers to the West from Snizhne. And as an example, other maps exist showing how rebel-controlled territory changed in July, August, and September. Therefore, it is possible that, when the videos were made, rebels did not control those towns or parts of towns (videos were taken by the cities’ entrances). As is the case with the photos, the lack of other public videos or photos (as of May 2015) of this Buk travelling, for example, through Donetsk, through Luhansk, from Snizhne to Luhansk, or from Luhansk to somewhere else, suggests that the Buk wasn’t transferred through these territories. There’s not even photo or video evidence at all where you could see the Buk vehicle with rebels being nearby that would prove that rebels had Buk at any point. 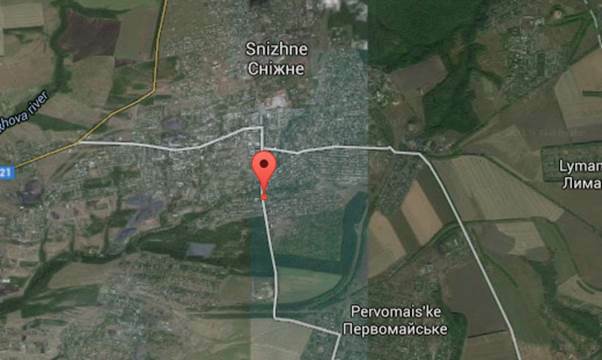 Therefore, the Buk vehicle was probably moved to these three areas by Kiev’s forces to make short videos. 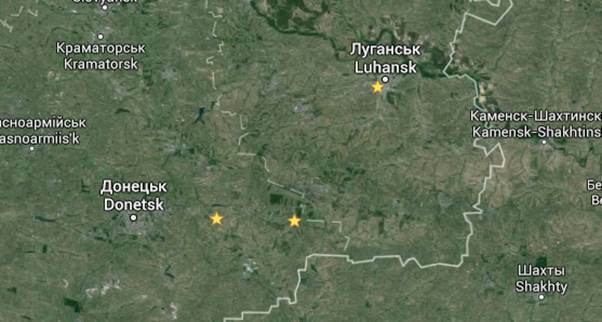 The Buk vehicles filmed in Zuhres, Snizhne and the one filmed in Luhansk are probably different ones altogether. The “unique” truck, as seen in Luhansk and Zuhres videos, doesn’t mean that the Buk is the same (for more info, read “The white truck”). Let us closely examine each publicly known photo and video that show suspected Buk vehicle, allegedly belonging to rebels. In his post, a full translation of which is available here, he wrote, among other things, that: (a) the video was taken on July 18, at 4:50 am by Ukrainian MIA units of covert surveillance; (b) his wording about the location was such that it would make the reader think that it’s moving through Krasnodon (50 km from Luhansk), towards Russian border; he did not mention Luhansk at all for some reason, but he surely knew the exact location; the true location (Luhansk) wasn’t known to the public at least until July 22 (a day after Russian MoD briefing, which assumed the video is from Krasnoarmeysk; the reason as to why the MoD guessed wrong will be discussed in a chapter dedicated to Russian MoD briefing). As mentioned in the beginning of the chapter, neither the fact that the video was taken somewhere in Luhansk (this road, parts of Luhansk might have been under Kiev’s control at that time) nor the truck with its “unique” features (see “The white truck”) point directly at rebels. In this Luhansk video, we can see that at least one rocket is missing (extra space is visible between rockets, and Mr. Avakov said so in his post). A vigilant observer will notice that the back of the Buk is also covered. 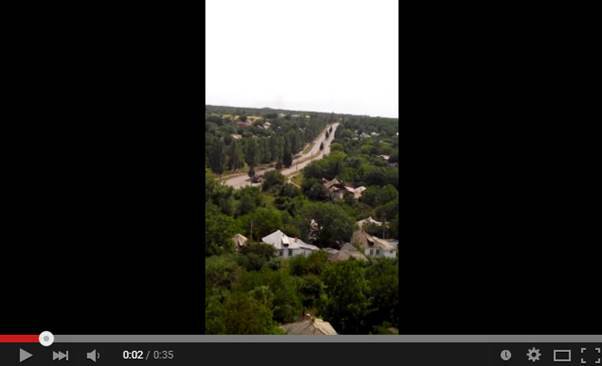 According to Mr. Avakov, this video was filmed almost 12 hours after MH17 was shot down. Thus, a question arises: why this Buk vehicle is being paraded in public, with the driver being fully aware that MH17 was shot down, having Buk’s back covered, but not the missiles, as if advertising the missing missile to the world? Other issues exist: The lack of HD version of the video (even though it was filmed allegedly by “Ukrainian units of covert surveillance”), no other videos or pictures are available of this Buk travelling later between Luhansk and either Russia or Krasnodon; more possible problems on this page. Why Mr. Avakov misinformed the public regarding where the video was filmed? Daily Mail and Paris Match still write (more than 10 months later) that this video was filmed in Krasnodon, with Paris Match insisting that they have on record Ukrainian source saying Krasnodon is the location. On July 25, 2014, Paris Match wrote an article that included this photo, which, until then, was never before seen (refer to the article for a bigger size of the photo). As of May 2015, these Paris Match photos is the only photo/video material available that show suspected Buk with “fingerprints” — features that are unique to a Buk vehicle. However, Buk in this picture looks completely out of place: Buk looks unclear, as if it was stretched out with software, while the truck’s white cabin is very clear. If, in the original photo of Paris Match article, you will look at the place where Buk’s wheels are supposed to be, you will notice an even bigger nonsense, especially considering that it seems to be a bright day. You can read the telephone number, but you can’t see the details, where Buk’s wheels should be? Other than Buk looking out of place, the resolution of the photo is low. Some parts of the photo (Buk, trees) look like they have been significantly stretched out using software, while others (left-most tower, cabin) look much clearer. It looks like a significant portion of the picture has been manipulated (most importantly, Buk). Yet, this picture is being used to convince us that Buk was in Donetsk city and that Buk is from Russia. As mentioned before, the Paris Match photo (thanks to “the side skirt fingerprints”) was used by, for example, Bellingcat to link the Buk vehicle with the one that was, at some point, photographed in Russia. The author of the Paris Match photo has probably found a picture of a Russian Buk that was available at that time on the internet (probably of a Buk that was in a specific Russian region). He used it to create this “Russian trace” by bending the photo, as shown in Bellingcat’s article, but in a reverse way. An added bonus is the clearly visible telephone number, and some parts of the photo link the Buk to Donetsk city — a rebel stronghold. The photo manipulator killed three rabbits with one shot: created evidence pointing at Russia, made the telephone number visible, and linked Buk with Donetsk city, producing “stronger” evidence that tie rebels with Buk. Other issues: (a) the photo was released 8 days after MH17 was shot down; (b) initially, Paris Match said this photo was taken in Snizhne (but it was, apparently, geo-located to Donetsk); (c) Paris Match are not disclosing the name of the photographer; (d) Paris Match has been allegedly caught manipulating photos years ago. The video was uploaded to YouTube on July 17, 2014. It was geo-located to Snizhne, not far from Southern entrance. It was also shown by the head of Ukrainian Security Service Valentyn Nalyvaichenko on July 18 in a press conference. The low quality video (360p) shows some sort of military vehicle at a significant distance, not being carried by a truck, but driving by itself. It may be the Buk launcher or the Buk loader. It is hard to see the details: for example, whether it is carrying any rockets or is covered. A car is also seen driving nearby, which looks like it’s escorting the military vehicle. As discussed in the beginning of the chapter, there are no guarantees that Snizhne or this particular part of Snizhne was under rebel control on July 17, 2014. This video was made in Zuhres, close to Southeastern entrance of the city. If this Bellingcat article had the original Zuhres video, it has been deleted from YouTube. If we search YouTube for “зугрес бук” (“zuhres buk” in Russian), the earliest video seems to have been uploaded on July 22. This doesn’t mean that the original video wasn’t uploaded on July 17, but most likely, it didn’t indicate that it was from Zuhres and/or was kept under low profile for 5 days. If the mentioned Bellingcat article is correct, this Twitter post (the account no longer exists) brought attention to the video and provided the exact coordinates. If we Google search the link of the Twitter post, the earliest date that we see this post mentioned is July 22. This date is somewhat interesting: both the real location of Luhansk video and the Zuhres video itself were coincidentally discovered a day after July 21 Russian MoD briefing. If you haven’t done so, I advise you to read the beginning of this chapter as to why this video doesn’t implicate rebels. 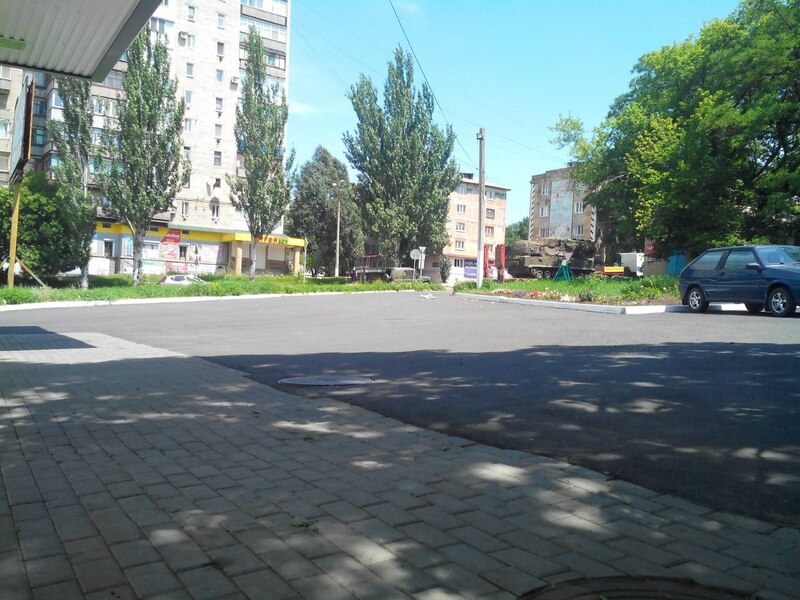 This photo was uploaded somewhere on July 17, 2014 and geo-located to Snizhne town. Just like in Snizhne video, the Buk launcher or loader here is driving by itself. Hardly any details (for example, rockets, Buk number, etc.) of the vehicle can be seen in this picture. The quality is low and the highest resolution of this photo that seems to be available is 337 x 600. The military vehicle takes up only 1/50 of the photo. These facts alone suggest that Buk could have been easily added there (see “The white truck” for an example). According to Bellingcat article, this photo was uploaded to a social media site (this link might not be the original source) on July 17, 2014. It was geo-located to Torez. It exhibits the same kind of flaw as Snizhne photo: the object of interest in the photo is very small, making it hard to verify the photo’s authenticity. In other words, the truck and Buk might have not been in the photo and could have been added using a photo manipulation tool (see “The white truck” for an example). Shortly after MH17 incident, Ukrainian Secret Service (SBU) published on their page an image of Buk, allegedly belonging to rebels, photographed at night (bottom-right photo). One of the rockets is clearly seen as having a red tip. In reality, this photo is of Ukrainian Buk that was moved by Kiev side in March 2014, the video (this is not the original uploader) of which was available online. SBU removed the picture from their page after the public learned of this fact. 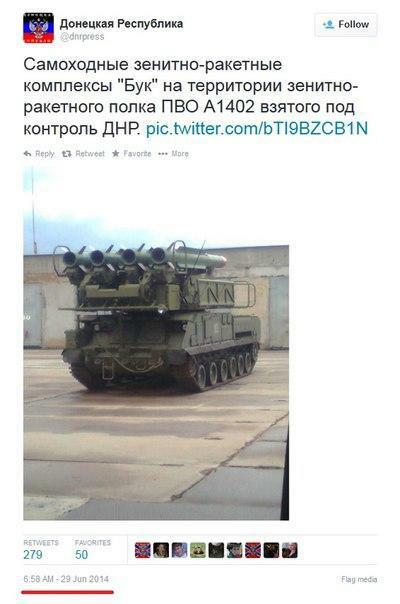 A Twitter account named “dnrpress” allegedly made a post on June 29, 2014 showing Buk vehicle and text, implying that it was captured from air defense base, А-1402 (for more information, read “Captured Ukrainian air defense base” section). Without even verifying the authenticity of this account (anyone can create an account with an “official name,” use DNR flag as an avatar, post what seems like official information/news for months, and at the right time, post disinformation) or question the motives of the poster, thanks to this page, we see that this picture was taken from a photo album, dated 2011. It is alleged that the owner of the “unique” white truck said that rebels have stolen it. He could be either lying, someone told him that rebels stole it, or someone who stole it said he was representing rebels. 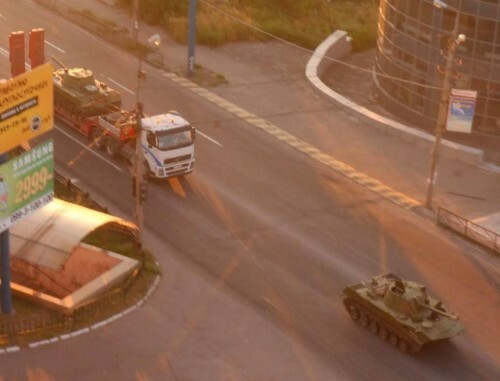 The Zuhres video with the truck might have been made on July 17, but the only other known video of this truck was allegedly made the next day in Luhansk, in the early morning, giving probably plenty of time for the truck to get from Zuhres to Luhansk without even entering rebel territory. Another important thing to consider is that all three videos might be showing three different military/Buk vehicles. In case of Zuhres and Luhansk videos, Buks could have been loaded into the truck somewhere nearby. This photo was uploaded to Twitter on July 17, 2014, with a caption “witness shared the photo of the moment the rocket was launched…” It looks like it is presented as evidence on the Ukrainian SBU page (May 2015). The original photo published by Twitter user was of relatively low resolution (1024 x 678). The date and the time of the photo is hard to verify. When MH17 was shot down, it was cloudy in the region (here is the weather forecast for Snizhne), but on the photo, we see an almost clear sky. Another indicator that this photo is not authentic (is not of a trail photographed on July 17, 2014 in this area) is the lack of other photos or videos of this trail, taken by somebody else on July 17 showing the trail at this place. Buk rockets are loud, and they leave a trail for a relatively long time. Assuming the photo itself is real, it was probably taken another day, but the rocket artillery system may have left the trail. As an example, here is a [very loud] video of the use of rocket artillery. In December 2014, Dutch RTL News interviewed the “anonymous” photographer of the original “Buk trail” photo. Two new photos were presented. These photos are of very high resolution (4928 x 3264) and are in BMP format (at least those that are publicly available). The first one is allegedly that of the original “Buk trail” that was uploaded on July 17, but with no color enhancement. The second picture (with the wires) was allegedly taken seven seconds before the first. There are a couple of significant issues with these two photos, questioning their authenticity: (a) they were presented four months after the MH17 incident, giving plenty of time for the photo manipulator to work on the details; (b) if you download the photos and look at the photo with the wires at an actual size (not zoomed out), you will notice that it is blurry (compare it with the second photo); the excuse/explanation for that [not mine] is his camera focused on the wires. As mentioned before, the original photo of the “Buk trail,” posted on July 17, had a flaw — there were no clouds. So, I think that in order to make the original photo more authentic, another one was produced, but this time with the clouds and which would be as if it’s a zoomed out version of the original. It is hard to hide evidence that photos were glued up together when working at such high resolutions: many pixels would need to be properly aligned. However, the wires and the blurring effect here coincidentally help make it possible. 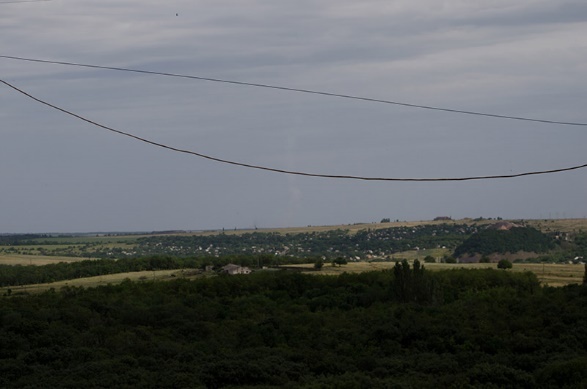 Even though the photographer is “anonymous,” this Dutch blogger knows his name, has more details, and he even decided to come to Ukraine and get to the roof of the photographer’s house. There is no reason why the author of these two new photos waited 4 months and wouldn’t post them on the internet right after MH17 incident, as he did with the one with the “Buk trail” photo that “has color enhancement…” Other than, of course, if they didn’t exist at that time. In the article, it is unclear why the author wrote: “Before the Malaysian plane was shot down, rebels had boasted of obtaining the BUK missiles.” There are no videos, audio, or even news from mainstream Russian media of any rebel commander saying/confirming at that time, before MH17 was shot down, that they had Buk. There were random posts on social media (for example, “Buk from Twitter”) by anonymous people and Vzglyad article (see “Vzglyad article”), but it wasn’t said by a rebel commander. The “boasting” was also about a captured Ukrainian Buk on June 29, not of it having been provided by Russia. No photos or video materials seems to exist that would prove rebels captured Buk vehicle on June 29 during the alleged attack on the air defense base. Kiev denied on June 30, 2014 and July 18, 2014 that any of their Buks were captured (see “Captured Ukrainian air defense base” for details). Reuters cites Khodakovsky, but provides no links to the source: the audio or video of the interview. However, the interview, labeled as “Alexander Khodakovsky’s interview for Reuters agency,” is hosted on a site called Svoboda, which is part of Radio Free Europe/Radio Liberty. Svoboda’s page also writes that Khodakovsky confirmed that rebels had Buk. If we look at Svoboda/Reuters video, we see that it’s an audio track that is 2:24 minutes long with a few added pictures. If we listen to it, we notice that at 0:57 the audio quality changes dramatically, and Khodakovsky is suddenly talking about another thing. This part was, without question, glued together. The next glued parts are at 1:13. The words suddenly interrupt here, and he’s talking about something else. Therefore, this 2:24 long audio track is combined from at least three different tracks. How can we be sure that his words were not taken out of context? This could be verified by listening to the full Reuters’ interview, which also probably had a video. However, it looks like Reuters did not release the full interview to the public. Khodakovsky has denied to the Russian media as having told that rebels had Buk to the Reuters’ interviewer. Even though the exact words that Khodakovsky said in Reuters/Svoboda soundtrack were probably taken from another interview, you can see in this video interview how open-minded/talkative he is when it comes to the MH17 incident and the possible theories. Reuters probably ended up with a lot of material when they interviewed him after MH17 incident. Reuters probably interviewed Khodakovsky after MH17 was shot down, took phrases out of context, glued up the tape together, and presented it as an interview of a rebel commander, allegedly taken before MH17 was shot down (the caption under Khodakovsky’s photo in Reuters’ article says, “Rebel commander Alexander Khodakovsky of the so-called Vostok battalion – or eastern battalion – speaks during an interview in Donetsk, July 8, 2014,” confusing/suggesting to the reader that the interview was made on July 8). On July 18, 2014, Ukrainian Secret Service has released audio tapes of allegedly intercepted calls of rebels. It is important to verify the authenticity of the tape first. For example, were phrases taken out of context, and it was glued together from many pieces just like the Reuters’ “interview” of a rebel commander? The difference between the tapes “leaked” by Ukrainian SBU and the ones that, for example, were leaked in early 2014 (Ashton: snipers in Maidan shooting at both sides; Nuland: where she talks about what people should be in Ukraine’s government and who shouldn’t; Tymoshenko) is that, unlike the SBU ones, the last three were confirmed as being real by the people that were on the tape. A popular social media account named strelkov_info exists with hundreds of thousands of followers. The name “Strelkov” is a nickname for one rebel commander that, until the end of summer 2014, was involved in the conflict in Ukraine. It is unclear who or how many people control this account. They post all sorts of news related to the rebel side. They use Strelkov’s photo as an avatar (he was very popular), but Strelkov did not have an official Twitter, FB, or VK account. First, the post doesn’t say “we shot it down,” it says that it was shot down (three days before the incident with MH17, AN-26 was shot down by rebels; there was initial confusion that another AN-26 was shot down when the MH17 debris was falling; see “AN-26 shot down on July 14, 2014” for more info about that incident). Second, the poster could have been anyone, as again, this is not Strelkov’s official account and never was. Vzglyad’s article included a link to the post they quoted, but it seems the link is not accessible. Nevertheless, their article includes a comment left by a user named “Кейн Пиллер”, posted on July 14. The commenter writes: “Editors, be vigilant! 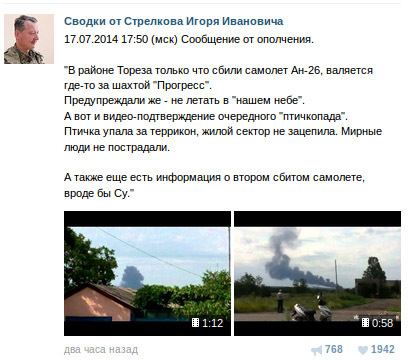 The message about Buks is not from rebels, but ‘from experts in air defense.’ LNR has published a denial.” Then the commenter provides a quote from head of LNR Igor Plotnitsky, where the head said, on top of other things, that the planes were shot down using MANPADs, and that the planes were probably flying not higher than 3 thousand meters, which allowed rebel forces to use Igla MANPADs. That Plotnisky’s quote, denying the use of SAM (Buk), was also published on July 14 in social media under a VK account strelkov_info (this is not someone’s official account, but a popular place for news “from the front”), as well as in RIA Novosti. Even though the post/link that Vzglyad is referring to is inaccessible and was probably deleted, Google saves internet’s pages in its cache, providing access to deleted content for a limited time. Someone accessed a cached page of the post after it was deleted and used a website that can save a snapshot of a page. On it, the URL/link matches with the link in Vzglyad article. After reading the post, it becomes clear that Vzglyad omitted key words at the start of the post, which states that the message is from “experts in the field of air defense” and omitted the word “Думаем, что”, meaning “We think that.” This explains the previously mentioned user’s comment in Vzglyad’s article who warned the editors. Another copy of the quoted post exists on this user’s “wall” at the same social media website. This picture is on Ukrainian SBU (Secret Service) page about MH17 (checked in May 2015). 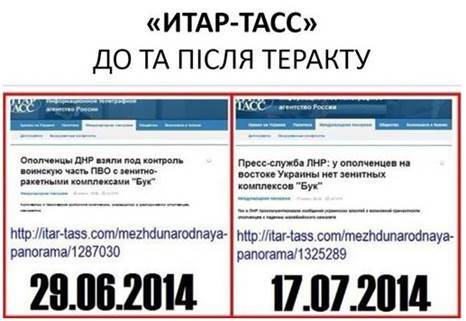 The caption in Ukrainian says: “ITAR-TASS, before and after the act of terrorism.” Then two screenshots are provided of articles from Russian information agency TASS. The article, dated 06-29-2014, has a title that says: “DNR rebels captured Ukrainian air defense base with Buk complexes.” In this article, it is written that the number and the condition of the Buk complexes is unknown. This article is about alleged captured Ukrainian Buk complexes, and not of Buk having been provided by Russia. Therefore, it’s unclear why SBU still has it on their page, as the Ukrainian and Western narrative is that the Buk was a gift from Russia. There were reports on June 29, 2014 that Ukrainian air defense base was captured that had Buk complexes. No video or photo material seems to exist of rebels standing by a captured Buk or of the captured Buk itself. Other than the Reuters’ glued up tape (see “Reuters’ exclusive interview and the audio tape”), no rebel commander ever said they had Buk complexes. Kiev has also denied on June 30, 2014 and July 18, 2014 that any of their Buks were captured (see “Captured Ukrainian air defense base”). There were rumors in the media that a damaged/non-working Buk complex was left at Ukrainian air defense base, which rebels allegedly attacked on June 29, 2014 (this Ukrainian source probably was the first who mentioned the non-working Buk being left at the base). Kiev, later, on June 30, 2014 and July 18, 2014, denied that any of their Buks were captured (for more information, read “Captured Ukrainian air defense base,” “TASS article,” “Reuters’ exclusive interview and the audio tape”). Therefore, Kurginyan probably got this rumor about broken and captured Ukrainian Buk from the media and believed it. After MH17 incident, EU has imposed sanctions against Buk manufacturer Almaz-Antey. The purpose of Almaz-Antey’s report/conference was to prove “the company’s non-involvement in the MH17 tragedy” and that EU’s sanctions against the company are unjust. Almaz-Antey said that the analysis was based on data of the debris from the Netherlands. They also offered to make a live experiment/demonstration at company’s cost. They did not rule out other theories. Almaz-Antey uploaded a video with English subtitles explaining the theory. BBC deleted this video within a day. On July 24, they explained the reasons why it was deleted — it didn’t meet their editorial values. They said it is being worked on and will be released again. A day after MH17 was shot down, official Kiev says, “… at that moment, Ukrainian fighter jets did not fly in the Ukrainian space.” What’s interesting, Kiev said it on July 18, before the Russia’s Ministry of Defense briefing of July 21, before the BBC video showing witnesses who saw the plane, probably before any mainstream media was even talking about a theory involving a fighter jet, and maybe without being asked. There is a high possibility that NATO was monitoring Ukraine’s skies through AWACS all the time since March 2014. As far as I know, NATO did not provide any official data either confirming or denying that Ukrainian military jets were flying there on July 17. 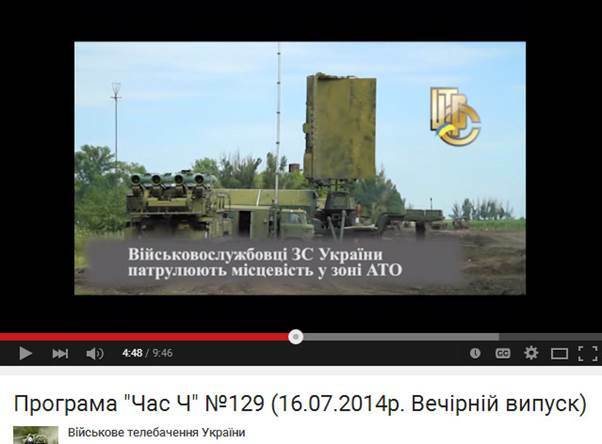 On July 16, 2014, a video was uploaded to YouTube showing a Buk vehicle with rockets, a radar, and a caption that these are Ukrainian forces in the zone of “ATO” (“anti-terrorist operation”). The YouTube channel’s description says, “Official video hub of TV & radio studio of the Ministry of defense of Ukraine.” This is an official channel, because this verified Facebook account links to it. Since rebels did not have aviation, this Ukrainian air defense system was probably there to protect against possible air attacks from another country. On December 22, 2014, Russian newspaper/news site named Komsomolskaya Pravda (KP) released a video interview of a whistleblower who was previously stationed at Ukrainian base in Dnipropetrovsk, but who moved to Russia. He claims to have personally seen Su-25 taking off from a base in Dnipropetrovsk with two R-60 rockets, which are used against aircrafts, and Su-25 returning without them, all on the day when MH17 crashed. This is in contrast to Kiev’s statements. The whistleblower also said that he overheard the pilot say later that the plane [supposedly MH17] was at the wrong time, at the wrong place. To protect his identity, as he feared for his life and the life of his relatives in Ukraine, his voice was changed and face covered at that time. However, on June 3, 2015, Russian Investigative Committee has released his name — Evgeny Agapov. Russian RT showed scanned copies of his passport as well as part of a video of this witness being questioned by Russian investigators (probably in December 2014, after KP interview; the news at that time said that he was questioned by FSB and passed a lie detector). In this KP video, he released the last name of Ukrainian pilot who flew the plane that allegedly had R-60 missiles and returned without them. It was Voloshin (Волошин). On December 25, 2014, Ukrainian SBU (Secret Service) confirmed that this Su-25 pilot exists, that he did take part in the military operations, but said that Air Force wasn’t used that day, and that Voloshin’s jet was under repairs. A YouTube user translated the video of the interview with the whistleblower to English and provided subtitles. His translation seems to be accurate. On June 3, 2015, the day when the whisteblower’s name was announced, Komsomolskaya Pravda (KP) uploaded a much longer version of the previously recorded interview and without the voice changer. They published an array of articles concerning MH17. They released a 50-page report (which was translated to Russian by US’ RFERL/Svoboda), where they track a Russian Buk moving through Russian territory. Why Bellingcat thinks this Russian Buk is the same as seen in all those well-known pictures and videos? Because of the first Paris Match photo (July 25, 2014) showing the so-called “Buk’s fingerprints” (Buk’s side skirt damage visible only on Paris Match photos) and because of the second Paris Match photo (which was “discovered” somewhere in January 2015), where now a “netting covering” can be seen. The problem? These Paris Match photos are photoshoped (for more information, read “First Paris Match photo”). They use all sort of “evidence” with whatever the source, quality, and authenticity, as long as it fits a certain narrative. Bellingcat used this photo of a truck with blue lines as evidence in their article that allegedly proves rebels had the truck on August 6, never mind that it’s an incredibly low resolution material, with objects of interest of very small size, making it easy to manipulate (change details, add vehicles) with tools like Photoshop, and make it look realistic, as was demonstrated in “The white truck” section. At the same time, they dismiss BBC Russian witnesses who saw the plane and Kiev’s own videos that show Buk launchers right in the zone of the so-called “ATO.” This is why Bellingcat’s investigations cannot be taken seriously. However, they do have a good collection of accurate data regarding the locations of those known videos and photos that show Buk vehicle, and some other useful info, not only from their own articles, but also from commenters. They wrote, “Complicating things even more, the BUK’s active radar cannot identify the type of airplane targeted. Fighter jet? Passenger plane? It is difficult.” — A website exists that shows live position of the passenger jets in the sky. “Bellingcat was also able to determine the missile launcher’s origin.” — Bellingcat “investigators” don’t look like an impartial group to me (see “Bellingcat investigation”). “Later on July 17th the same BUK, now with is identification number 3*2 painted over, was photographed by the Paris Match photographer in eastern Ukraine.” — The Paris Match photos are photoshoped (see “First Paris Match photo”). “Just after July 17th he [the rebel commander Khodakovskiy] told a reporter from the news agency Reuters that the separatists possessed a BUK on the day the plane was shot down.” — Reuters’ 2-minute soundtrack/interview was glued up together from at least three parts (see “Reuters’ exclusive interview and the audio tape”). Why Ukraine, a side, which should have been considered as one of the suspects, is on this investigation team (and probably receiving all the secret information)? What was this investigation team doing for about 256 days? They should have been looking for any kind of witnesses within days, a week after the catastrophe. Why are they ignoring witnesses who saw the military jet in the sky (in BBC Russian video, villagers told the correspondent that they heard at least two explosions in the sky and saw a military jet at the time when MH17 crashed; see the appropriate section in this chapter for the BBC video)? The video is 11:44 minutes long and is in Russian. I heard that most of the people in Donetsk and Luhansk regions are Russian speakers, but why are the subtitles in English and not in Ukrainian? Why are they showing Paris Match photo, which was clearly photoshoped, and the low quality, low resolution Torez and Snizhne photos, which could have been very easily photoshoped as well (see the appropriate sections that examine these photos)? They said that rebels stole the white Volvo truck. What proof there is that the truck was stolen by rebels (see “The white truck”)? Bellingcat mentions that new audio tapes appeared in the video that were previously unknown. However, was their authenticity confirmed (see “Ukrainian SBU audio tapes”) or were they some actors? So, after 256 days from the day when MH17 was shot down, one of the official investigation teams releases a video. In it, they show all the photos and videos that I have covered in this paper, which are used to point fingers at rebels and Russia. This probably proves that no other videos and pictures are publicly available of this Buk within rebel territory, and that I didn’t miss any. First, some background. By July 21, 2014, just three days after MH17 incident, the hysteria in the media of certain countries was at a level probably not witnessed ever before. It was as if Mr. Putin personally shot down the plane. By this time, some of the photos of the Buk that we examined were on the internet; Ukrainian SBU has already released audio tapes and the Luhansk video with one missing rocket, pointing fingers at rebels and accusing Russia of supplying rebels with this Buk launcher. Washington Post wrote, “The U.S. State Department, as well as Secretary of State John Kerry during TV interviews on Sunday, reiterated claims that the passenger airliner was likely to have been brought down by a SA-11 surface-to-air missile.” New York Times wrote, “The United States government has concluded that the passenger jet felled over Ukraine was shot down by a Russian-made surface-to-air missile launched from rebel-held territory and most likely provided by Russia to pro-Moscow separatists, officials said on Friday.” It is only natural that Russia attempted to clear her name. By July 21, the following evidence was already known: July 17 — Snizhne video, Snizhne photo, Torez photo, original “Buk trail” photo, and photo provided by SBU of their own Buk taken in March, which they removed later; July 18 — Luhansk video, SBU audio tapes. US officials made statements accusing rebels and Russia, but provided no proof. All the mentioned photos and videos were showing Buk allegedly traveling through rebel-controlled territory. The true location of Luhansk video wasn’t known until July 22 — a day after MoD’s briefing; everybody thought it was in Krasnodon. The Zuhres video itself was either kept under the radar until July 22 or not published, yet; Zuhres video’s exact coordinates were published by a Twitter post on July 22. Reuters’ article with the “interview” of a rebel commander “confirming” that rebels had Buk was published on July 23. The first Paris Match photo was published on July 25. See the appropriate sections for more info about each evidence. It seems as if Kiev deliberately did not say that the video of a Buk with one missing rocket was made in Luhansk until Russian MoD had a say on July 21. 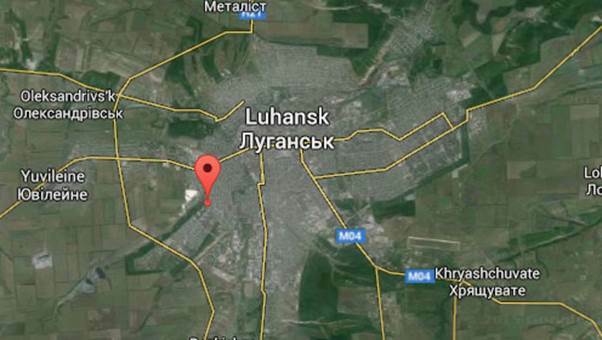 Then suddenly, on July 22, “the internet users” find the true location of Luhansk video and learn about a new Zuhres video as well as its exact coordinates (Twitter account, which has been deleted, released the coordinates on July 22; see the section dedicated to Zuhres video). One thing to note is MoD’s satellite photos show “satellite data” at the top; they are not just ordinary photos. That data may tell whether the photos are authentic or not. However, there is even one thing for those who think that the information is fake: MoD showed a satellite photo, allegedly made on July 14, of a Buk launcher and two loaders just 8 km North-West of Luhansk city. As was said, the true location of Luhansk video wasn’t known yet, and Russian MoD said that the Luhansk video was made in Krasnoarmeysk. Therefore, Russian MoD didn’t show this satellite photo of Buk near Luhansk to “make excuses” for any evidence that was known at that time to them or to public. Here is the video of the briefing. However, there is also a page on Russian MFA site with all of the photos and text (for some reason, the numbers on the photos that are on that page and on the video are mixed up). There are some mistranslations in the video involving numbers. Therefore, I recommend you to read the page on MFA site as well. July 14 satellite photo of Buk launcher and two loaders just 8 km North-West from Luhansk city; MoD showed this at the time (July 21) when Luhansk video’s location wasn’t known to public (except to certain people in Ukraine). July 14 photo with 60 military vehicles 5 km North of Donetsk city; among them, Buk launcher and radars. 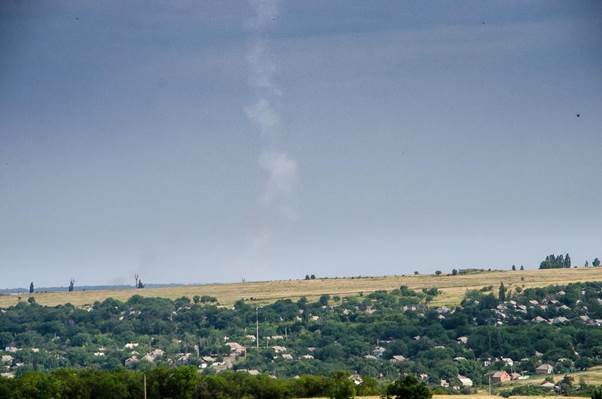 July 17 photo of the same area of 5 km North of Donetsk that now has Buk launcher missing. July 17 photo with Buk launchers near Zaroshchens’ke. It is just 20 kilometers to the West, 4 kilometers to the South from Snizhne. This looks like to be the exact place on Google map. 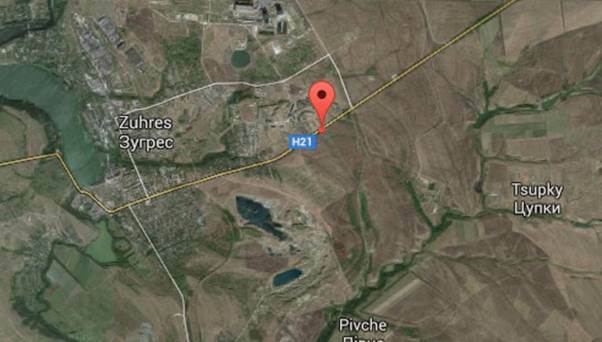 July 18 photo of the same area near Zaroshchens’ke, which is now missing previously shown Buk launchers. Video from Rostov ATC showing a detected military plane after MH17 was shot down. Peak activity of Kupol radars was registered on July 17. MoD confirmed that US “experimental” satellite that can determine location of a fired missile was over the area at the moment MH17 was hit with the rocket and asked US to share the data with the world’s community for analysis. Their satellite pictures include time and other satellite’s dada, which can probably be used to verify their authenticity. If these pictures were fake, US and other nations that track satellites and have their own would have probably officially confronted Russia with it and presented evidence that they are fake long ago. Kiev’s head of MIA Mr. Avakov released the Luhansk video on July 18 via a Facebook post. 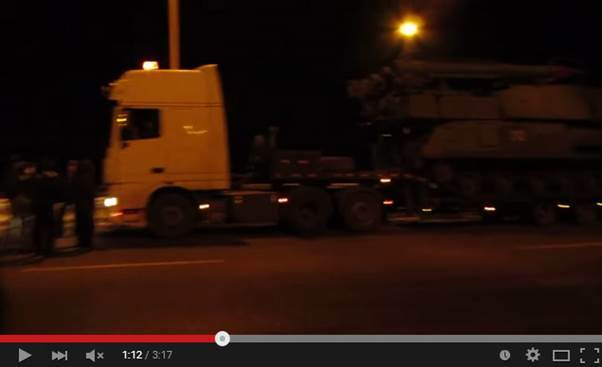 The post’s wording was as such that this Buk was moving through Krasnodon towards Russian border. He did not say anything about Luhansk at all. In fact, certain Western news sites still write that the video’s location is Krasnodon (see the section dedicated to Luhansk video for the FB post and other links). Therefore, Russian MoD couldn’t find the location in Krasnodon, but wanted to know where it was filmed, and just repeated what the Russian blogosphere was saying so that Kiev would provide the video’s exact location (as coincidentally has happened the next day). So, according to the head of SBU, Moscow sent the Buk to rebels, who decided to shoot down a Russian passenger jet so that Moscow would use it as a pretext to help rebels by further invading Ukraine, but rebels accidentally shot down MH17 instead of Russian one. Some of the problems in this theory: (a) rebels would need to be sure that Moscow would invade Ukraine and help them after shooting down this Russian passenger jet; (b) rebels would need to somehow mix up Russian passenger jet with another one, which is probably hard thing to do even if you don’t have the necessary radar equipment, as there are websites that show live passenger jet traffic. According to one of the West’s theories, which is in this video released by an international joint investigation team, in which Australia, Belgium, Malaysia, the Netherlands and Ukraine take part, Russia gave a Buk launcher to rebels on the midnight of July 17 by the Russian border. 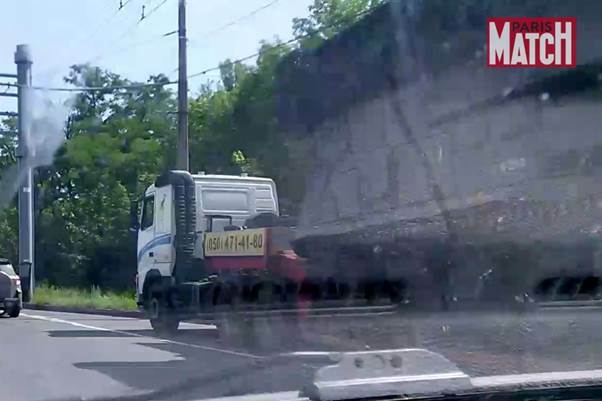 This Buk on a truck then traveled from Eastern border with Russia to Donetsk city, then to Snizhne, then it probably shot down MH17 by accident, thinking it was Ukraine’s AN-26, then on July 18 this Buk was in Luhansk and then back to Russia. This theory is especially problematic if all they have as proof that Buk belongs to rebels are: stitched up Reuters’ audio tape; photoshoped Donetsk/Paris match photos; low resolution, low quality, photos taken in Torez and Snizhne, where Buk/truck are of very small size; the three known videos, which were filmed by certain cities’ edges (in cities like Luhansk, where Ukraine’s own military map is showing that they are by that city); and some other material examined in this paper. Out of all the evidence that we examined, only the three known videos pass the basic checks for forgery. However, these videos barely show any details of Buk and were made by the cities’ entrances, in cities where Kiev’s own military map is showing that Kiev’s forces are nearby (Luhansk city, Snizhne). The Luhansk video itself, allegedly taken 12 hours after MH17 incident by “Ukrainian covert agents,” by the edge of Luhansk, at a place with a nearby field with roads that can be used as a point of entry and exit, with the back of the Buk covered, but clearly showing the missing missile, tells me that all of this is a false flag operation. By July 2014, rebels lost significant chunks of territory, and continued losing it until around mid-August or September 2014. Rebels were severely outnumbered at the time of MH17 incident. According to the FT article, Kiev has 60 Buk launchers, as well as military planes, which at that time in summer made frequent sorties. In addition to that, when you see that there is no proof that rebels had Buk, that there is no motivation for them to intentionally shoot down MH17, that its accidental shot down by rebels would be problematic even if they didn’t have the necessary radars due to websites that show live passenger air traffic, that none of the planes that rebels ever shot down involved Buk, you get to a theory, in which Kiev or a group within Kiev’s forces either accidentally or deliberately shoots down MH17. But why would someone destroy a civilian jet, frame the rebels, and point fingers at Russia, saying that it gave this weapon to rebels? What would be to gain from all of this? The answer to that is geopolitics that involve US (NATO), EU (NATO, Eastern partnership program), and Russia. The trade between EU and Russia is much more significant than it is between US and Russia. US sanctions alone would not be effective. The sanctions that EU imposed on Russia before July 29 were not as severe; they mostly targeted individual people in Russia. The new sanctions made Russian companies/banks unable to get new credits from EU. Russian companies needed to return over a hundred billion euros by the year’s end, and they couldn’t get new, relatively cheap credits. In June 2014, the price of oil has began steadily falling. This drop in price was probably artificially created (thanks to certain US allies) due to oil’s overproduction. The price of oil plays a big role in Russia’s budget. The plan of EU’s severe sanctions and the artificial drop of oil price was probably to either force Russia into submission regarding geopolitical issues or to shatter the Russian economy, which could make a lot of citizens unhappy with their government, creating a platform for a “colorful revolution.” December 2014 was the peak of problems that Russian currency has experienced, but it managed to stabilize. So, what role does MH17 play in all of this? The EU could not have imposed these sanctions without a consensus: all EU member states needed to agree. Before MH17 incident, there was a group of countries within EU who did not want to impose these tough measures. Coincidentally, shortly after the catastrophe, as we see, their opinion has changed. Thus, the motivation for those that could have intentionally destroyed the plane would be to affect the opinion of a group of EU countries that were, until then, against severe sanctions. This in turn could have crashed Russian economy, creating severe problems for the Russian government and their geopolitical stance involving Ukraine. Those who shot down the plane would need to have some sort of degree of certainty that this tragedy would be used to punish Russia (and that they wouldn’t be tried in Hague). Did the attackers take a risk or they knew the answer? If the public found out that it was Kiev’s side that shot it down, EU and US citizens would probably be in dismay if their governments would provide financial support to Kiev from that point, which Kiev’s government would need just to stay afloat. However, EU’s and US’ elite want something from Ukraine (covering it here would be out of scope of this paper). US and certain EU countries were not interested in “not blaming any side until investigation would conclude,” they wanted those sanctions on Russia for geopolitical reasons. We have found out that rebels did not capture any Ukrainian Buk vehicles on June 29. There was a rumor from Ukrainian source about a damaged Buk vehicle having been left at a base that was allegedly attacked by rebels. The rumor of a captured Buk was not confirmed, as on June 30 and July 18 Ukrainian sources denied that any Buk complexes were captured. No photos or videos seems to exist that would prove that rebels had Buk either prior July 17 or after July 18. No rebel commander ever said that rebels had Buk. There’s no evidence that any Ukrainian planes were shot down with anything other than MANPADs at any point in this conflict as of May 2015. On July 14, 2014, Ukrainian President’s site made a statement that AN-26 was shot down near Ukraine-Russia border at an altitude of 6500 meters and that it can be only possible if a more potent missile was used, which was probably fired from Russia. Videos exist of allegedly the same AN-26 at the time when it was hit in the air. The videos do not show any signs, such as the trail of a Buk, that a more potent missile was used than a MANPAD. Ukraine implemented new restrictions in its air space after the incident with AN-26. We have examined all photos and videos that allegedly show the rebel’s Buk. A video from the official investigation team, released on March 30, 2015, serves as proof that we’ve covered all important, publicly known photos and videos. The Paris Match photo itself shows very clear signs of it being fake. The Torez and Snizhne photos are of low quality and low resolution, with objects of interest (Buk, truck) of very small size. The Buk could have been easily added there using Photoshop. 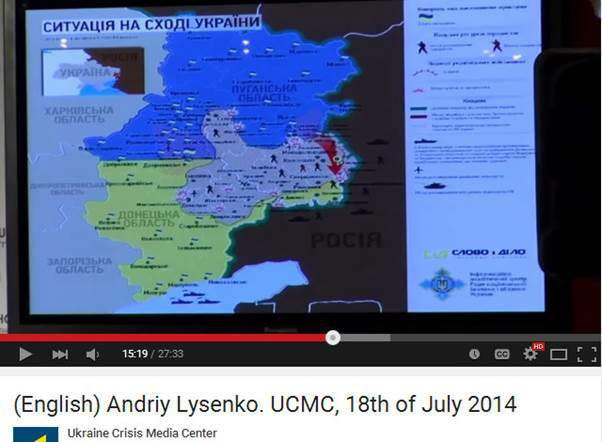 The three known videos do not prove that it were the rebels driving it, as no other rebels forces are seen, and Kiev’s own military map, displayed in a press conference on July 18, 2014, clearly shows that Kiev’s forces are right by Luhansk city, where the video with one missing rocket was made. 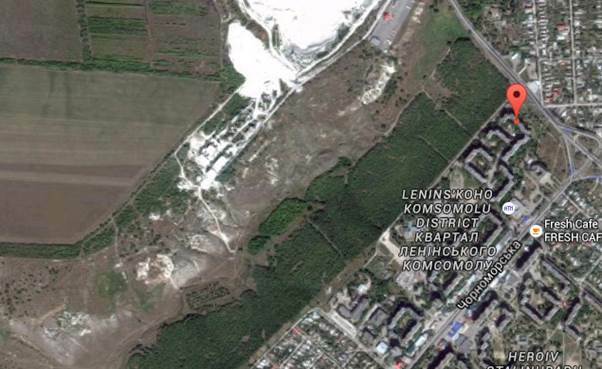 The map also shows Kiev’s forces being near the area where Snizhne is located. The third video was made in Zuhres, which is just 30 kilometers to the West from Snizhne. We have found an interesting pattern. The mentioned photos showing Buk vehicle (two Paris Match/Donetsk, Snizhne, Torez), where the Buk was most likely added to the photo with the help of Photoshop, were made deep inside the cities. While the three videos were made by the cities’ edges, where there is a field nearby with some basic roads. The location of Snizhne and Zuhres videos is also in the Southern parts of towns — the part where Kiev’s map shows Kiev’s forces to be advancing from. When Kiev’s new government received more legitimacy in early summer, they have significantly stepped up their military operations against the rebel republics and tried to overwhelm them with force rather than solve the conflict through talks. Rebel forces were rapidly losing territories in June and July. Kiev’s own map, indicates that rebels might not have been under control of those particular roads/areas of towns on July 17 where the videos were made. We have found serious flaws in the “Buk trail photos,” we also found that Reuters’ interview with one of the rebel commander’s (2:24-minute tape) was made using at least 3 pieces, that Ukrainian SBU audio tapes cannot be considered authentic, that a particular account in social media does not belong to a rebel commander. We have found other useful material, which might be less known to some people: witnesses shown by BBC Russian, who saw a military plane on July 17 when MH17 was shot down; Kiev’s own video showing Buk launcher in the zone of “ATO;” a soldier who was stationed in Dnipropetrovsk, who saw three military jets take off on July 17, one of them having “air-air” rockets and it returning without them; Buk manufacturer presented their analysis in which they concluded that if MH17 was hit by Buk, it would be only possible with specific rocket model and launched from specific area. We’ve looked at data from Russian Ministry of Defense, presented just three days after MH17 incident. They showed Buk launchers right by Luhansk city, Donetsk city, and Buk launchers in the area about 20 kilometers West from Snizhne and 4 kilometers to the South. They also detected Ukrainian military planes in the area when MH17 was shot down. Their satellite photos show data that probably can be used to verify their photo’s authenticity. If these photos were fake, Western governments would have officially confronted Russia shortly after they were published. Ukrainian SBU theory as to what has happened is absurd. One of the Western theories is not too far from absurd (considering the evidence that we examined, and which the investigation team showed in their official video): Russia gives rebels Buk on the night of July 17, then someone accidently shoots down MH17 using it, thinking it’s AN-26 due to lack of some radar equipment (all while websites exist that show live air traffic), then Buk moves back to Russia on July 18. However, there are other theories. As we found out in the chapter that examines theories, around July 29, EU introduced significant sanctions against Russia. Before that, EU probably didn’t have a consensus among its member states. Therefore, MH17 incident might have played a role in changing the opinion of those particular EU countries regarding tough sanctions on Russia. Some people in Ukraine were certainly interested in this turn of events, as well as some key Western countries (for geopolitical reasons). It is not clear what took down MH17: Buk, military jet, or Buk and the military jet. What is clear is that none of the evidence available on the internet, which we explored connects the Buk vehicle with rebels and Russia. The lack of any videos of this Buk travelling within rebel territory, from Eastern border with Russia to Donetsk city, from Snizhne to Luhansk city, and the lack of any video and photo materials where rebels could be seen near any Buk vehicle also indirectly proves that rebel forces had nothing to do with it. The places where the three videos were made, especially circumstances concerning Luhansk video, tell a thinking person that it was a red flag operation — to put the blame on rebels and Russia in order for EU to impose severe sanctions on Russia. The official investigation is being artificially stalled. For example, NATO did not either confirm or deny that Ukraine military planes were there on July 17, 2014. NATO was certainly monitoring Ukraine’s sky with AWACS, awaiting Russian invasion of Ukraine. The reason for stalling the investigation is geopolitics. If it turns out — and everything is pointing that it is the case — that it weren’t rebels who destroyed MH17, EU’s and US’ financial and other support to Kiev will probably be significantly reduced, and that might be an end to Ukraine’s current government. Moreover, what would these Western governments say to their citizens? After all, they imposed sanctions on Russia shortly after the catastrophe, not on Ukraine. Posted on June 8, 2015 by 7mei.nl. Bookmark the permalink.